For those of you unfamiliar with Echo Screen, They are, as far as I know, a poppy-rock quartet from straight outta Jersey. 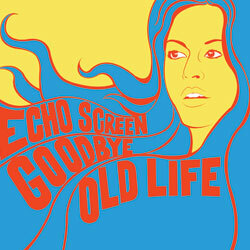 Goodbye Old Life may or may not be a departure from the bands previous two efforts, but then again it might. It is way in the pop vein, but in a weird good way. It is, oddly, like a mix between James Taylor, Neil Young and Ben Folds. Normally not my cup o’ tea, but I’m kind of in a groove with this five track EP. I say what the hell, Echo Screen is alright, even if they sound almost nice enough to be grandmother safe. The tracks tend to alternate between quick slow quick (to an extent, ’cause track five wrecks that scheme) They all have a flowing dreamy feel to them, but consequently I prefer tracks 1. “I Amsterdam” and 3. “When I Escape (L.A.)”, the later very obviously about Snake Plissken. Never the less, some not-so-bad stuff, from the East. Then again, what did I expect? New Jersey has all the best bands.